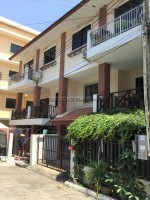 Pratumnak Townhouse. This corner 3 storey, 4 bedroom townhouse is located just 2 minutes walk from the beautiful sugar beach, on Pratumnak hill. In a nice quiet area of the city, but conveniently located just a 5 minute drive to either the hustle and bustle of Pattaya City centre, or Jomtien beaches. The house has received some simple renovation a short while ago, and is offered un-furnished. The ground floor can be a large open plan living-diner, with the next 2 floors providing 2 bedrooms and 1 bathroom on each level. There is a flat roof on the top of the roof which can be used as a large open area for entertaining. The title deed is held in a Thai name, and the seller is offering to pay 50% of any transfer fees.